France, who took over the leadership of NASCAR following the retirement of his father, Bill France Jr. in 2003, has issued an apology and said he will take a leave of absence from the stock-car racing organization. He will be replaced in his duties by Jim France, his uncle. Reports say that Sag Harbor Police pulled France over after he went through a stop sign in the Hamptons at approximately 7:30 p.m. ET. Police found the oxycodone after a search when he was pulled over. TMZ reported that they were told that after being stopped, France began dropping the names of powerful people, including that of President Donald Trump, whom he – along with drivers Bill Elliott, Chase Elliott (who won his first Monster Energy NASCAR Cup Series on Sunday), Ryan Newman and David Ragan – appeared with an endorsed for president at a rally in Valdosta, Ga. in 2016. 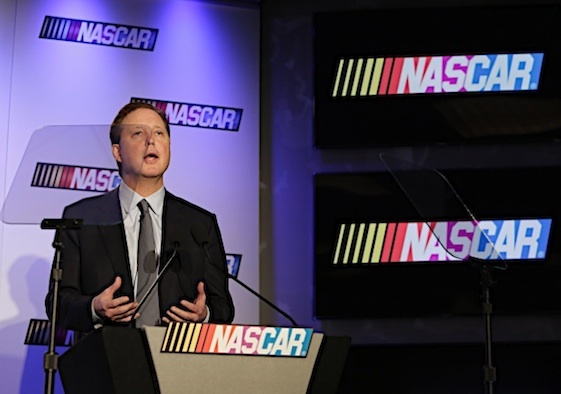 Monday afternoon, both France and NASCAR responded to the situation. So, during the infrequent public appearances when Brian appeared to be under the influence…he probably was. Will he have to take the same ‘Road to Recovery’ that the ‘regular’ folks do? More to the point, will anyone notice that he’s gone during his leave of absence?